And lest we become accused of becoming technical chartologists, here is an interesting chart from the St. Louis Fed, showing the total value of bank credit purchased/held outright by the Federal Reserve. Nice inflection point over the past month there disclosing of who the major securities buyer recently might have been (hat tip reader Clark). Hey Tyler - Thanks for these charts - they are tough to get in normal TA programs. It seems like the retail sales are taking the shine off the bulls, that XLF level is peculiarly close to its six-month average price (who knows if that means anything). 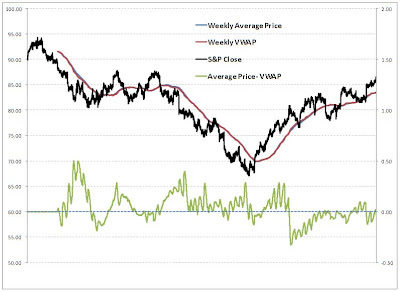 I know this is a broken record BUT the last chart shows (in my view - evidence of what we all suspect) that the banks have bid up prices to encourage stability in order to enable equity capital raises before reality bites. Remember back to Japan where it was less about derivative interconnectedness and more about inter-related shareholdings - every bank bought up other banks equity in significant size - essentially self-supporting the entire system. msorense - feeling your pain in SKF also - key issue is expectations of number of losing days in a row - can quickly spike. The 2x and 3x ETFs need to be traded NOT invested in. I learnt the hard way - run some stop against them and snap away quick profits - they pop enough for that and offer plenty of swings for swing traders to like - so even though you may be a fundamentalist (like me that believes the end is nigh for these guys), trade it technically. The last chart is just Fed holdings of Treasuries and Agencies. They had been running off their securities portfolio to fund other lending programs until they announced quantitative easy last month. Doesn't that last chart just represent fed monotizing...and in essence an epic fail as the 10 year remains stubbornly high. any leveraged ETF seems to have substantial "beta decay." If you look at both the FAS (3x long financials) and the FAZ (3x short)they are both way down over the last 6 months. These leveraged ETFs across the board are struggling to make money whether long or short....and so far look like they should be left for short term trades or hedges. 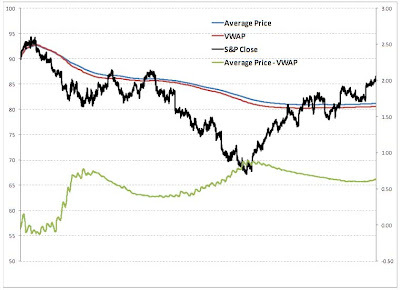 Re the VWAP study, thanks for the comparison to the ma's. 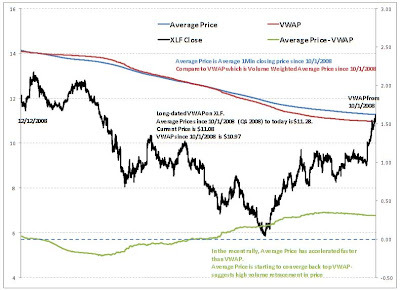 @msorense: XLF could drop 50% everyday and never reach zero and leveraged ETFs only follow the percent movement if that makes any sense. msorense -- You're taking the case of a single 100% drop (which is very unlikely). Yes, a single 100% drop would result in a single 200% rise in the inverse. But remember, we've already seen greater than 100% rises in the inverses, so clearly there are other scenarios which result in greater profits. Multiple, successive 25% drops in the IYR would give you multiple successive 50% rises in the inverse. After a few days (as we saw last Fall) this can compound to more than a 200% gain. msorense: You are not differentiating between a simple and compound interest. If XLF were to drop by 50% each day for ever it would not hit zero but its counterpart such as FAZ (I know it is not inverse to XLF but to DJUSFN) would go towards infinity (* 1.5 1.5 1.5 1.5 .... 11). Bottom line is that the principal increases each day. Therefore, hope we have a steady drop on financials every day! Fed securities holding leaped by nearly $300b since mid-February and $240b since early March. According to the 9 April H.4.1, the Fed had $236b in MBS (all Freddie, Fannie and Ginnie at face value) on its balance sheet compared to $70b on March 11 and $0 on January 7. Unfortunately, the process is not that transparent. QE and permanent SOMA operations over the period were only $80b, and there was some Treasury paper in there. Are you suggesting primary dealers dumped valuable MBS to bid up each other’s shares? Pretty sinister (although not completely unbelievable).